This entry was posted in Poetry, Well-being, Writing and tagged decluttering, Dreams, Na'ama Yehuda, Tea house. Bookmark the permalink. Aw…. Dale! I’ll be happy to twiddle me thumbs many more times while waiting for such lovely posts! I think your tea-house-wannabes are going to find a lovely home with someone else who’d love them with dreams all their own. Or maybe they’ll spend their days belly-full of tea. Who knows. What matters is that you had the dream (lovely dream, too! I’d have come to your tea house for a cuppa and a bit of chit chat and some gossip and ya know, gal stuff) and that you lived life alongside it even as it percolated — front burner or back burner. I think of these kind of dreams as ‘life fertilizers’ – and in the best sense of the way. A leavening for some times where there might not be a ‘plan’ otherwise. Thank you for sharing the lovely collection, and for the stories, too. Am so so glad that my poems wriggled about in your muse to generate this post. I raise my cup (of tea, of course!) to ya! Hugs, my friends — and may the downsizing lead to all the new dreams that will become your new reality! Yes, they will. Coz they ain’t all coming with me!! Of course, I did hang on to them all this time because, maybe I can still hold some tea parties? But I don’t need more than 4-5 so the rest… buh-bye. Not only would I have served tea, but delicious cakes, too. Thank you for stopping by and inspiring me to write it in the first place! Yes indeed! Here’s to all that! The teapots were a tempest inside another life. A beautiful storm of a collection, with a plan. And that’s the whole thing, ain’t it? A collection that possesses a destination? Unlike most collections, which end up on eBay or the trash. And even IF that destination was not something you arrived at, the fact of the matter is, you arrived at so many other wonderful destinations along the way. Just love the way you worded this. Yes, a collection that possessed a destination – I like that! And yes, the original destination was not meant to be but that’s ok. The paths leading to and from it brought me elsewhere and you know me, I’m all about the trips! It’s true, you had a destination that changed along with the course that your life was charting at the time. In so doing, there was no ‘loss’, it was life. Happening, as you say. Life is always subject to change, as you well know. But it’s not in what happens to you, it’s in how you respond to it that matters. I like how those teapots feel like a photograph of life moments, each teapot a different memory and stage of your life. It’s a unique and beautiful way of framing your story. It IS okay. Because you survived, you kept on kicking. And you ARE a trip, haha! Absolutely. It’s all about how you respond to what happens. They do, don’t they? I like that you like. Guffawed! Love it! The world needs more guffawing and less of the other stuff, if you ask me. Yes, I only speak ze troof. And yes. A guffaw is so much more, dontcha think? More than a snort, more than a giggle. It’s right from the belly and yes, we definitely need more. You do, eh? I’ll allow it. If guffaw was a candy bar, it would be filled with caramel and almonds and coated in dark chocolate. Of course, everybody’s guffaw is different. But a guffaw, no doubt about it . . is good stuff. The judges accept! Ding! Ding! Ding! Yes. Which is what makes it such an interesting thing. Imagine how boring it would be if all guffaws were the same. All guffaws the same? No . . no . no, that just won’t do. Guffaws are not Toyotas . . . This ain’t like Publishers Clearinghouse is it? Because those bastids keep lying to me . .
Ummm… No. I thought those guys were dead and buried? Nope, they’re alive and well and living it up in Argentina. Is that where they ended up? Do they have their own Ed McMahon? Gordon Ramsay serves em up at his Hells Kitchen Restaurant in Vegas. What? You mean the VW Rabbits? Yep . . .
Oh Lordy! Good turned into Food! I’m killing myself laughing here. Love how you go with the flow, B! Dammit! Food guffaw was so much fun while it lasted. I do! Buahaha! Wait, what? I can win a V-Dub if I paste those inane stamps on the “Big Winner!” box? And then I pick up the Rabbit in Argentina? I say we keep it around. What say you? Darn tootin’! Make sure you stick em all on the right boxes… would hate for you to make the trip.and be turned around coz you put the V-Dub sticker on the $50K box. I might have to think up a recipe for guffaw . . .
God! That would be so awkward! And I bet they wouldn’t even spring for my return flight, the cheapskates. Of course not. You thought it was Publisher’s Sweepstakes? No, no… this is Cheapskates…. I’m starting with almonds and dark chocolate, because of course. I never trusted those bastids. Oooh! Count me in, k? Because. Definitely, of course. Nor should you. Not an honest bone amongst them. Jes! Now . . with that said, I was thinking of taking a u-turn and making the dish savory. So we have our sweet, and now . . the challange! It was the balloons that gave them away. When strangers bring balloons to your crib . . it’s trouble. Yes! Chocolate goes very well with savoury. Many an idea are already brewing. I was thinking baby-back ribs slathered in a spicy dark chocolate sauce with a rub that incorporates the crushed almonds for some fun texture. Dale, Dale, Dale – this was a triple win for me – I love english breakfast tea – the song, and then mmm -I feel your contentment with planning but staying in tune with what life actually brings – and then to the cups in the cupboard – they brought a smile. and the way we looked at cleaning out stuff was that someone else could use the dishes – etc. Ahhh, Yvette. How pleased to hear from you. It is the best tea! And I needed a “dreams” song. Yes. We can plan but sometimes, we need to stay in tune – especially if that dream wasn’t the “end all”, yanno? Glad my helter-skelter cupboard made you smile (I left it as is). I believe I will feel that FREEDOM once I start. Yes. Travel, breathe, live. My ultimate goals. anyhow, that tea also came at the right time in my morning and so who knows all the things combined to make it still sit in my mind. You mean to say they do “bullet” tea as well? With the butter? And yes. Über hot water for the tea… I’ll have to try that now. Yes, I do. Damn house has been for sale since April. I just changed Agents and am more motivated so… thanks! and fingers crossed that the right buyers will come at just the right time. Most interesting. Will definitely try it. And I thank you! I’ll take all good vibes and crossed fingers! Ooh! I just read the link to hers! I’m leaving my two cents. Oh good! We be chatting over 100 words! Thank you, Mel! The road does have many paths and forks. It was a cool collection to have, I must agree. It is hard to say goodbye but I really feel I must. Beautiful pots! I’m sure they will make someone’s day if you sell or give them away. Or multiple someones. Thank you, Jess. That’s what I think, too!! Thanks, Joy. There was definitely a facing the truth moment and I’m sure once I’ve started liberating myself, I’ll feel lighter both physically.and emotionally! Yep, at a certain point it’s like yanking off that bandage: just DO it. And whew, it feels better when it’s done. That’s a lovely piece Dale, really heart felt. You go girl and if you come to Worcestershire I’ll buy you a few pints of IPA!! Thank you, Shrawls. Much obliged. A beautiful post, Dale. We have all sorts of dreams, and they change, but then we have new dreams, right? I’m glad you’re going to keep some of them. They’d be lovely at a themed party. Thank you, Merril. That we do and we can’t stay stuck on some that don’t fit anymore. Absolutely new ones come along. 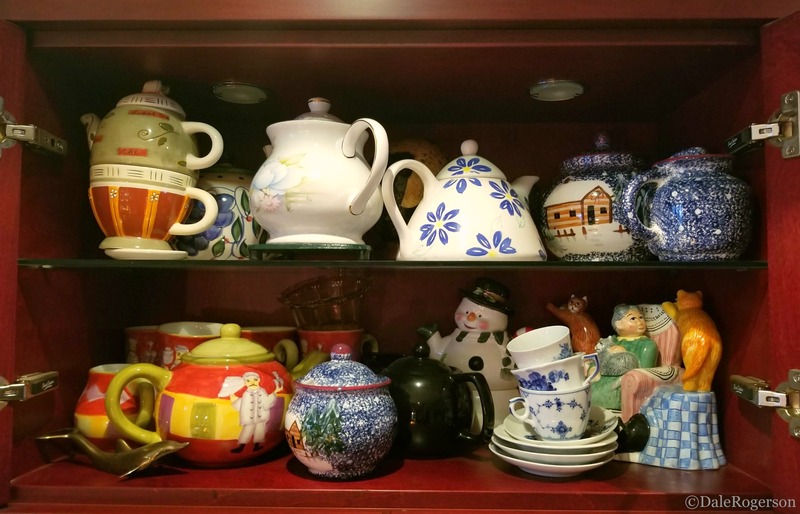 A post because of an image that couldn’t be inserted into a comment elsewhere = a post about the changes in life that occur – a post with the teapots serving as the unknown of the future. I love tea cups, too. No, they don’t stop, they change…. I once had an angel collection. Those things can get out of hand, can’t they? I let most of them go when we moved to the house we’re in now…and we upsized. 😉 After 25 years in a 950 sq ft cracker box we needed breathing room and we had the money to do it. Every time you share a post like this, my admiration goes up a notch. Today when I have my afternoon tea, I’ll think of you. 😉 So cold here, the hot liquids will be on tap. Although I find that brewing tea in a Keurig works quite nicely. Shalom and hugs, my friend. Aww… I thank you. Today is not overly warm here, either. There will be tea in the afternoon, to be sure. Cheers! Comes a time when the collection becomes more of a burden, dontcha think? I agree with you on choosing to keep only things we love. Thank ya! I will join you! Yay for you, Dale! You sound very together! So, those teapots…. I instantly thought they could be crushed and made into a fabulous mosaic! Don’t be fooled. I am great on “paper” LOL! Oh, Dale. Makes me sad because YOUR TEAHOUSE WOULD HAVE ROCKED. No doubt about that in my mind. Your delicious confections, your energy, would have lent the place a vibe I think a lot of people could use. I love your teapot collection. Especially the one with blue flowers on it, and the one with the cabin. So cozy and cheery. Like you–and your teahouse that you’ll create in another place/time/universe:). I only wish I’d had the hutzpah when it was time, yanno? I let others influence me and discourage me. I may hang on to those two 😉 Plus the white one in the front with the pale flowers on it..
Quite a collection for sure. I think you would be a great tea room operator. Maybe someday. Of course, you would have to put up with people. There’s the rub. Seriously, now you have me wanting to open a tea house. I’d buy all your teapots and use them… but I think I’m past this stage too. Alas, I love the idea! I so hear ya, Dawn. The restaurant biz is a tough one. I don’t think I want to spend that much energy at this point in my life. Mine would have been a maximum 25 people and I would have had a selection of cakes to go with the selection of teas… small, intimate affair. Strange how that went about, dontcha think? It still is in my cupboard. Am loathe to lighten the load but honestly, they’ve not been used in a dog’s age (😉). And, I don’t have friends like Roxanne (we drank pots and pots of tea) who enjoy a cuppa so I only make myself a cup at a time, now. I asked myself that same question. Jeez Apple, with all the stupid emoticons, you couldn’t have a friggin teapot? WTH? Your post reminded me of a similar collection of ceramic penguins. Those cheerful enduring flightless birds, and I have a gob of them. All in a box (because I’m too damn lazy to dusty the little buggers all the time). They represented a time of great upheaval that I managed to weather. I may have to think more about culling that collection and getting to the heart of why I hang on to them, yet won’t display them. *Sigh* 🐧Therapy here I come. Apple, Samsung. They are all guilty. So I Googled it (I’m silky that way) and this 🍵is supposed to be green tea. But we want a pot. Amiright?